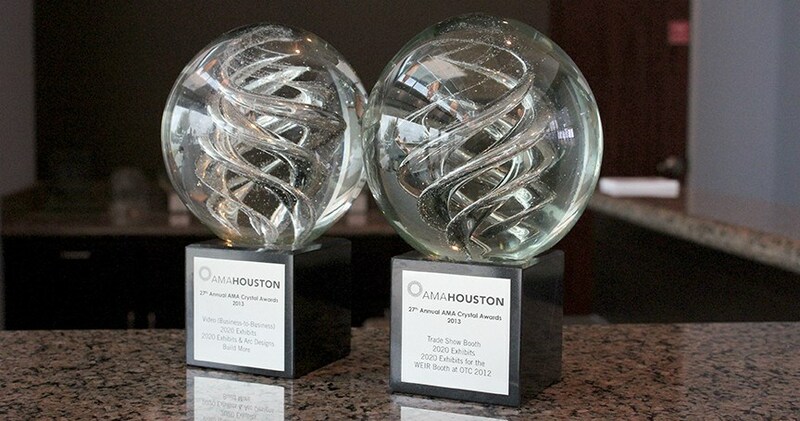 The American Marketing Association honored 2020 Exhibits for marketing communications excellence at the 27th Annual American Marketing Association Houston Crystal Awards Ceremony. Recognizing the most effective marketing communications that fulfill stated objectives and produce measurable results, the AMA Crystal Awards recognize best in class marketing and communications. 2020 Exhibits earned a Crystal Award in the Video, Business to Business category for their dynamic and compelling video on behalf of Arc Designs, Inc. The innovative and forward thinking Arc Designs challenged 2020 Exhibits to help them tell their brand story – in a clear, concise and compelling way. Equally important for Arc was the delivery of a polished, strong brand presence featuring their proven depth and breadth of expertise which would stand up against larger, more recognizable “name” brands. In the Trade Show Booth category, 2020 Exhibits earned a Crystal Award for their creative design and execution of the WEIR Oil & Gas Exhibit for OTC2012. From the unveiling one of their newest pumps, DESTINY, to the demonstration of their turn-key, comprehensive products and services, WEIR’s presence at OTC 2012 delivered a strong impression, showcasing their brand and their business. With 300% year-over-year increase in leads, WEIR’s OTC 2012 experience delivered.